The Assam Chambers of Commerce (ACC) and Confederation of All India Traders (CAIT) on Monday jointly staged a protest against the implementation of Goods and Services Tax (GST) by the BJP-led government in Guwahati along with rest of the country. The protestors demanded the central government to simplify the process of GST. The protestors also opposed the acquisition of Flipkart, an Indian e-commerce company based in Bengaluru by Walmart, an American multinational retail corporation that operates a chain of hypermarkets, discount department stores, and grocery stores recently. The protestors also demanded the government to frame a pension system for the welfare of the businessmen across the country. 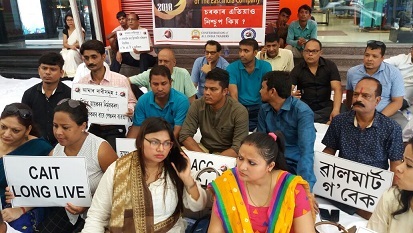 The protestors submitted two separate memoranda stating their demands, which were addressed to Assam Chief Minister Sarbananda Sonowal and Prime Minister Narendra Modi, before the Deputy Commissioner of Kamrup (Metro).